For GoDaddy, Media Temple or 1&1 domains, you can connect your custom domain automatically in a few easy steps! If you already have a website living at your root domain (e.g., www.mysite.com), you'll need to use a subdomain (e.g., promo.mysite.com). Your Unbounce landing pages can't live at the exact same URL as your home page. Select the client to which you would like to add your custom domain by clicking the arrow drop-down menu at the top left-hand corner of the screen. Click the Domains link from the left side navigation bar. Click the Add a Domain button at the top right corner of the screen. A new dialog box will appear. Enter your domain name (either a root domain or a subdomain). Click the Create Domain button to confirm. If you are connecting to a GoDaddy, MediaTemple, or 1&1 domain, follow the prompts to automatically set up your CNAME with your domain hosting service of choice. Why Should I Connect My Domain? How Do I Secure My Pages With SSL? 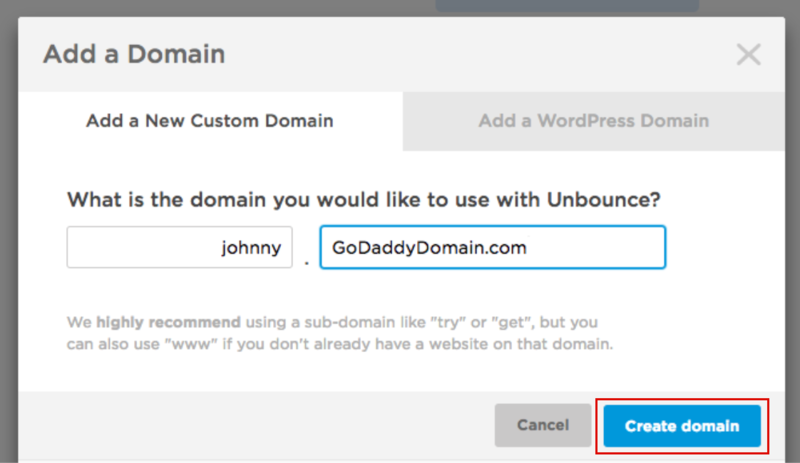 How Do I Add My Domain To Unbounce?